You are here: Home » OMG, Kooyenga! Gideon told the Israelites to blow their trumpets, sound a battle cry and light torches, simulating an attack by a large force. The Midianite army fled! Spot on, Greg, they do. It’s a rewrite of Woody Guthrie’s “This Land Is Your Land,” the folk singer’s “answer song” to Irving Berlin’s anthem. They sing it every weekday in the Capitol, now at 1,700 consecutive noon gatherings since March 2011. (Dollars to doughnuts, Dale has no clue why Berlin wrote the song or that he was a Jewish agnostic who hated Christmas.) Note to GOP legislators: Without dissent, we’d still be a British colony. It’s not the first time that Dale, a Brookfield teavangelical who would have you believe that his is the only brand of patriotism, has hated on the First Amendment. In July he made off with an 80-year-old singer’s permitted display criticizing Republicans, hiding it in his Capitol office and then playing fast and loose with the truth about the circumstances in his press release and in statements to reporters, who failed to follow up on his arguably spurious claims. By the time Dale had re-released his inner religious scold with the trumpet tweet, the singers had already come up with “Oh Lord, Kooyenga” (to the tune of “Kumbaya”) with the line “Someone’s lying again, Kooyenga.” It also refers to the suspicion that he fudged facts with discrepancies in what he told this reporter in July and what he told Sheboygan police in 2000 about his physical assault on his girlfriend’s brother. 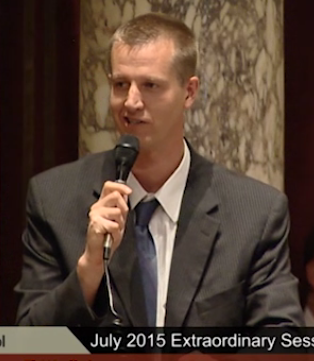 Rep. Dale Kooyenga wants a legislative upgrade and is running to replace Leah Vukmir, R-ALEC, in the state Senate. Was he trying to stop an impaired driver, as he claimed in July, or was he trying to punish the boy for missing the bus, perhaps intentionally, to a religious retreat in Indiana? The police report states that missing the bus “seems to be the root of the problem” and makes no mention of attempting to stop a driver “impaired by drugs and alcohol,” Dale’s justification in July for the assault. He did not respond to two emails seeking clarification of the discrepancy. “Oh Lord, Kooyenga” includes “Someone stole my sign” and “Someone’s drunk again,” the latter referring to one of Dale’s greatest hits from July 2015, recorded on the Assembly floor after the Capitol had been evacuated due to a bomb threat. Legislators adjourned to The Coopers Tavern across the street, a gathering dubbed a “bipartisan beer summit” by media. To some observers of the resumed floor debate on the budget bill after the “all clear” was given, it appeared that Dale may have had one too many. Wags on social media marveled at his “spirited debate” and mused that the 6-foot-7 lawmaker doesn’t have a hollow leg. Watch him in action at 2:32.18, 2:47.11 and 3:42.57 in the video (part 2 of 2). The Department of Administration is stonewalling open-records requests to make public the surveillance video showing the embarrassing theft of the sign, but efforts are continuing through legal channels. Though it may be God’s will that one of the chosen ones not be subject to the same rules mere mortals are. So for all you do, Dale, this one’s for you! The Rotunda is a great place to sing–voices carry well there. thank you Solidarity Singers.